New issue on sale now! Small TVs, speaker systems, DACs, headphones and more | What Hi-Fi? Our November issue is out today, available in print and online, and jam-packed with new reviews, Group Tests, our famous Supertest and more. 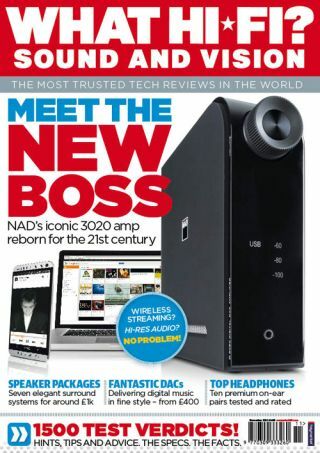 The First Tests section kicks-off with a review of the hotly-anticipated NAD D 3020, you can watch our NAD D 3020 unboxing video online to get an idea of this exciting new product. Elsewhere we have in-depth reviews on the new Monitor Audio ASB-2 soundbar, the Marantz M-CR610 micro system and Wharfedale 100-HCP speaker system. Samsung's latest 4K TV goes under the microscope, too, alongside the intriguing Focal Easya speakers, Naim Nait 5Si, a high-end Pioneer AV receiver and more. Our Insider section round-ups all the news from Europe's biggest tech show, IFA, while asking whether 2014 is the year that high-res audio goes mainstream. This month's Supertest is style speaker packages, with smart 5.1 systems from £800 to £1100 going head-to-head. The hard-to-beat B&W MT-50 will be up against systems from Cabasse, Dali, Focal, KEF, Monitor Audio and Q Acoustics. Something a little smaller? Our round-up of on-ear headphones between £200 and £270 should help you make that buying decision if you're in the market for some new cans, with the likes of B&W, KEF, NAD and Sennheiser vying for honours. On the subject of small, we also have a Group Test of sub-32in TVs, ideal for kitting out that second-room, kids bedroom or kitchen. Alba, Bush, Finlux, Hannspree, Kogan and Panasonic are on the starting grid here, with the cheapest TV at just £130. And you'll be surpised by the performance on offer. The DAC resurgence continues apace, so we've reviewed six of the most exciting products around if you're serious about getting the best sound from your source. The Arcam irDAC takes on the Audiolab Q-DAC, Meridian Director and more in a strong selection of the best products around at this price. There are round-ups of speaker cables and analogue interconnects, too, plus our Temptations section, Playlist and the Advice Centre. Don't forget you can save 17% if you subscribe – choose from the print magazine alone, or pay just £2.99 extra every six months for access to our iPad/iPhone edition as well.